Hedge-clipping is not considered to be a great craft, nor a sullen art, of gardening, but hedges are often the most important structure in a garden and pruning them properly can add greatly to the garden’s beauty. When we were children, clipping hedges was always a good way to earn money. Boy Scouts could do the job for a ‘bob’ but we would undercut them. Looking back, I wince at the thought of the damage we did to neighbours’ hedges, hacking away at them with blunt shears that were far too heavy for us. The type of plants that form the hedge, and the style of your garden, will dictate how and when to cut it. Informal, flowering hedges are the easiest to look after but have an untidy profile. Leggy growth should be cut back after the plant has flowered to maintain the shape of the hedge. Rather than clip with shears, remove the growth with secateurs. Formal hedges need to be closely trimmed to keep a crisp outline. While low-growing box hedges can be cut with vertical sides, hedges over 30cm tall should be tapered slightly towards the top. This allows light to reach the bottom of the hedge and prevents the base developing bare patches. Before deciding to trim a hedge to a complex profile, remember that the more complicated the form of a hedge is, the more work will be involved in maintaining it. Inspired by Christopher Wren’s crinkle-crankle wall at Wroxall I decided to turn a short length of beech hedge into a crinkle-crankle, deeply serpentine, hedge. The initial shaping was done with the aid of rope laid out on the ground. To keep the clean line of the hedge it needs to be clipped three times a year, rather than the once-a-year trim that most beech hedges need. 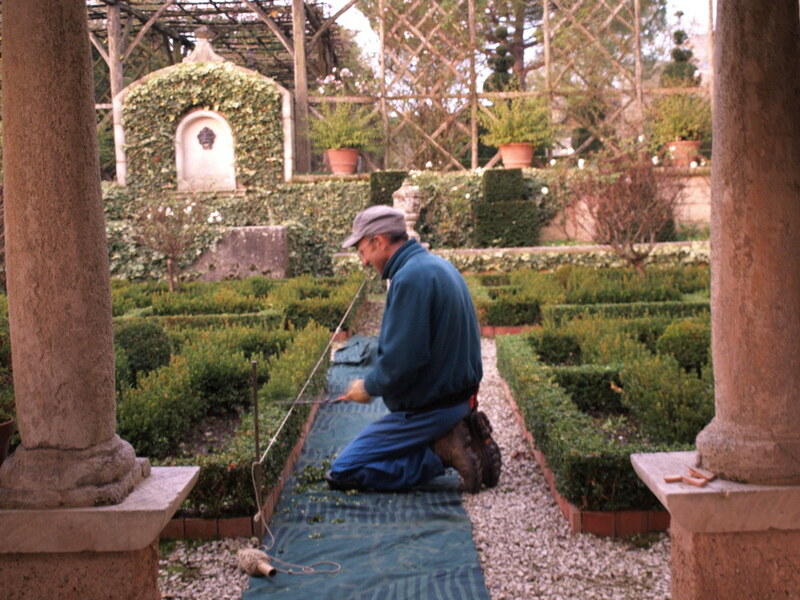 Tall hedges are difficult to maintain, particularly the top. Clipping with the top of the hedge at waist high is the least-exhausting position to work in. Moveable scaffold towers can be used to get you into the correct position but these are cumbersome and you need lots of space to manoeuvre them into position. A more practical solution is a petrol-driven mechanical trimmer with a cutting blade that can be adjusted to the desired angle. Clipping small-leaved evergreens such as box or yew into topiary shapes is not as difficult as it appears and is fun to try. Metal frames can be used as cutting guides for figurative shapes. Once the plant has grown through the frame, clip close to the metal. After a few years the frame will disappear inside the topiary shape. Ivy cut close to wire frames will give a more instant topiary look. For cubes, cones and other geometric shapes wire together bamboo poles around a plant as a temporary cutting guide. Here a string line is being used as a guide to clipping this box hedge. Topiary ‘lollipops’ are an easy way to bring a sense of formality into small gardens. Hollies and elaeagnus are the most robust plants for this. Clipped standard bay is susceptible to damage by frost, particularly in Scotland and the North of England, and quickly look burnt and ugly. The ideal time to cut both holly and elaeagnus is August but by the winter, when the sharpness of the balls is most important, they have started to make new, straggly growth. Trim-off any new growth at the end of autumn but do not cut the ball closely as frost can burn and damage the plant. In the spring, use secateurs to cut the balls into a tight shape, making sure to cut through stems and not leaves. You will need someone on the ground guiding you where to cut. With flowering shrubs and vigorous non-flowering ones (such as hawthorn and privet) pruning should begin as soon as the hedge has been planted. Reduce the height of the plants by about one third. This may seem drastic action to take on new plants, but if you don’t do it your hedge will always be thin and weedy at the base. The following autumn clip all the new growth back by half and start cutting the side shoots to the width you want the hedge to be. Conifers and slower-growing deciduous plants such as beech and hornbeam should not be cut back after planting. Trim side shoots by a third but leave the leading shoots to grow. The hedge will look thin and you may worry that the plants are not planted closely enough together. Hold you nerve and only begin clipping when the plants reach a few inches above the height you want the hedge to be, which will stimulate lots of side shoots and the hedge will quickly fill out. If you are clipping your hedge early in the year, check that there are no birds nesting in it first. If there are, and your clipping is likely to disturb them, you must wait until the chicks have fledged before working on the hedge. This is not merely a question of being kind to animals: it’s the law. Under the Wildlife and Countryside Act 1981 it is illegal to do anything to damage a bird’s nest while it is in use, or even being built. Buxus. (box) July, August. It is important that box does not dry-out when it is clipped. On very hot days clip in the cool of the evening.